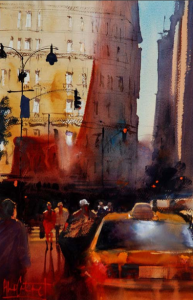 One of the best watercolorists in the world and one of our personal favorites, Alavaro Castagnet, teaches seminars in some fantastic locations all over the world. But this one in October of 2011 is particularly manageable for Southerners! Check it out! This entry was posted on Thursday, December 16th, 2010 at 4:30 pm	and is filed under Technical Information, Workshops. You can follow any responses to this entry through the RSS 2.0 feed. You can leave a response, or trackback from your own site.